I’ve been curious as to what kind of plants we’ll get if we cross an autoflowering strain with one of my favorite standard plant, White Label’s “Double Gum” (see our earlier posts for Double Gum info).We had an extra “Royal Automatic” seed from Royal Queen Seeds that we started on a windowsill, just to see how it would turn out without extra lighting. The plant is a mere 15 inches tall, due to the relatively meager light that it received during vegetation on a simple windowsill. 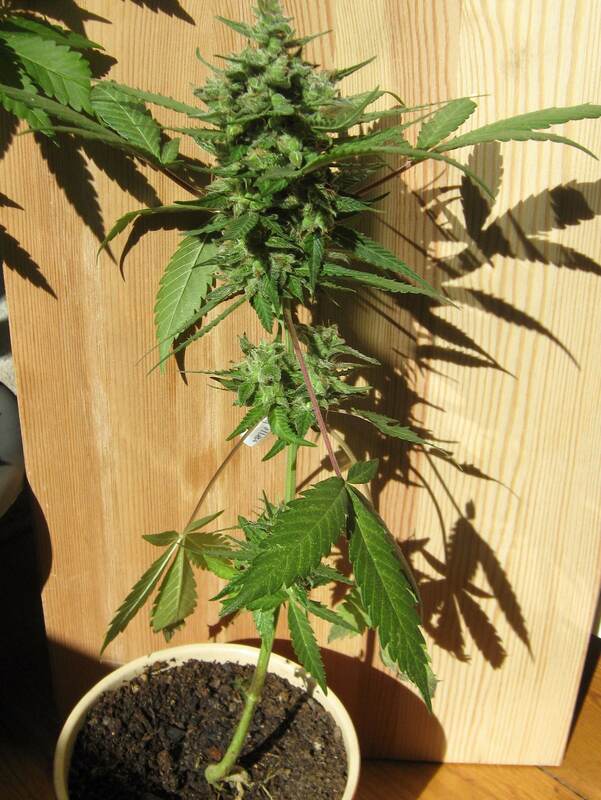 These plants can grow quite a bit larger if you give ’em full sun, but we wanted just a small plant for trying out a homespun autoflower strain. I’m expecting that the offspring from this cross may not all be 100% autoflowering, but we’ll try them outdoors in the spring and see what happens.